Northfield’s 1888 train depot is on the move this week. The Save the Northfield Depot (STND) group has been working for five years to raise funds and navigate the political, environmental and legal obstacles to be able to save the historic building from destruction and move it a block north up the (rail) road. Seeing ground broken and the building secured for the journey is an exciting milestone for historic preservation and a testament to the hard work of STND organization (you should read about the history of the Depot, the efforts to save it from destruction, train service in Northfield, and the details of the project on their very thorough website). The Depot’s move, however, will also be the first shovels-in-the-ground redevelopment work on this centrally located, repeatedly planned and very difficult site. The Depot is headed to what Northfield calls the “Q Block” on the west side of MN Trunk Highway 3 (TH3) named for the popular Quarterback Club restaurant and the forgotten Quizno’s sub shop (a space now occupied by El Triunfo–well worth the trip). The Canadian Pacific railroad (and high voltage power lines) bisects the block, the highway frontage makes the site visible but not easily accessible, the block has oddly-shaped parcels and multiple property owners (including the City of Northfield); the Q Block is not the easiest place to develop, in other words. Downtown Northfield used to exist on both the east and west side of what is now TH3. In the late 1950’s, a swath of seventeen buildings was razed for the new trunk highway running from Saint Paul through Northfield to Faribault. In the late 1990s, after 40 years of highway strip development, the prospect of a new Target store further south on the highway, and planning the realignment of TH3 through downtown, Northfield leaders were thinking how to ensure the success of the historic downtown remaining on the east side of TH3 and make better use of underutilized parcels on the west side of the highway. 1997 Ad Hoc report and 2005 Safe Crossing report: The 1997 citizen group and 2005 Safe Crossing task force both made recommendations for helping people walking or biking cross the highway by adding a traffic signal at the Q Block, but also be trying to recreate a local, human-scale streetscape along the highway through downtown to slow traffic and reinforce the sense of having entered downtown, rather than speeding through town. MnDOT’s actual realignment and reconstruction in of this highway segment did not robustly incorporate the suggestions. 1999 West of the River Guidelines were intended “to incorporate the west of the river area as part of the downtown” by encouraging zero-lot line development, two- to three-story buildings, and echoing the urban design of downtown. These guidelines were instrumental in rejecting a suburban-style Walgreen’s (which eventually built further south on the highway) on the Q Block and soliciting development proposals for what became the Crossings condo and retail site (worth its own post). 2006 Streetscape Framework Plan identified design elements in downtown Northfield and recommended a palette of public and private improvements for the downtown; the Quarterback Club was the first business to take advantage of cost sharing to add some of these features to its Q Block location. 2010 Northfield Roundtable Q Block Planning session (captured in their 2014 Framework Plan) noted: “The ‘Q Block’ could play a central role in creating an east-west axis for Northfield. Many have suggested it as a long-range location for a transportation hub that could provide a “hook” connecting emerging West Side redevelopment to the East Side historic downtown” and further adding ideas for a “greened” pedestrian crossing of the railroad as well as the highway. Despite all that planning interest and statements of intention, private tax-paying development did not occur. The proposal to move the Depot to the Q Block was met with both great interest as a way to stimulate long-sought development by some (including me), but significant skepticism by others because it was not “real” economic development. By 2012, the City Council (I was a Council member at the time) approved the Depot move with public support in the form of City-owned land to be transferred the Depot group and financial assistance from the Economic Development Authority. Yet, given the non-profit nature of the development, concerns remained the Depot was not the highest and best use of the property and might discourage additional future development. Preserves a singular and historic building which is uniquely intended to be located next to the railroad rather than having the train and its noise be a problem to be mitigated in other kinds of development. Creates an additional reason to cross the highway on foot or bicycle and an opportunity to redesign the infrastructure, especially if it is used as a transit hub and/or passenger rail is restored. In 2015, in anticipation of the Depot’s move, a more pedestrian friendly crossing at Third Street was planned (but its construction has been delayed). Can leverage additional development. The development bet is moving the Depot, restoring the building and making it useful again, will spark additional – tax paying – development to fill out the block, carry downtown back across the highway, and use buildings to shape the streetscape, calm traffic and restore the local street function back to this strip of highway. As the truck arrives to begin the Depot’s move just up the tracks to the Q Block, here’s a big round of applause for the Save the Northfield Depot organization for its hard work and persistence to preserve an historic building, lay the groundwork for more transit options, and break ground on redevelopment on the Q Block. 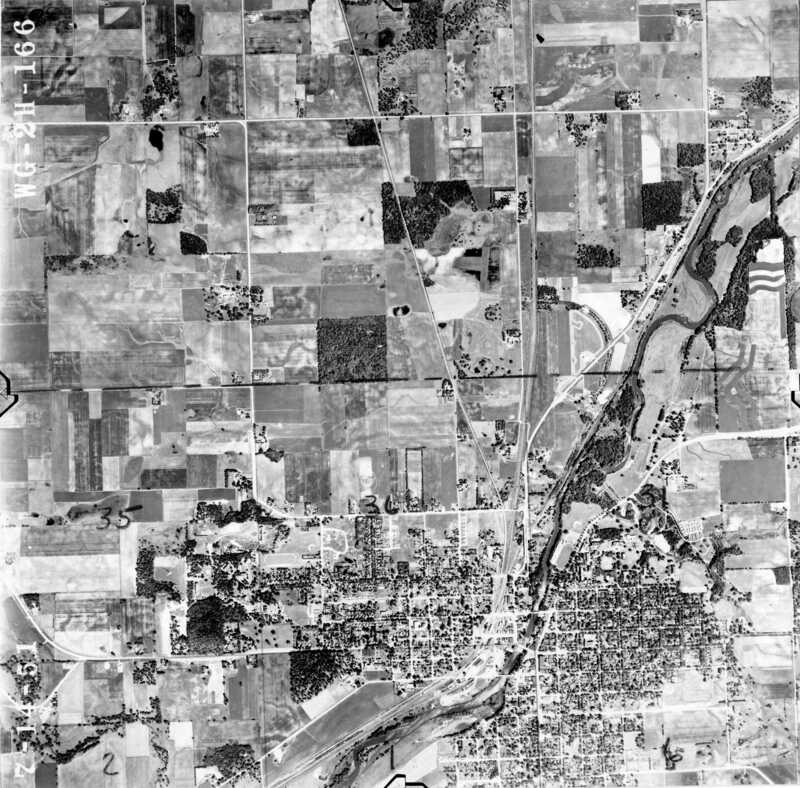 This 1951 aerial photo includes the downtown area as well as showing the couple blocks of “downtown” that existed between the railroad and the river. At the time, Hwy 19 came into town from the west via 3rd St W. It appears Hwy 3 (which was both US 65 and Hwy 218 at the time) used the bridge just downstream from the falls that ties into E 4th St, then continued south on Division St. I believe the highway then turned left on Woodley to eventually head down to Dundas and Faribault. By 1957, grading for what is now Hwy 3 south of 5th St W was completed, but would not be used for a couple more years. Most buildings between the railroad and the river still remained. 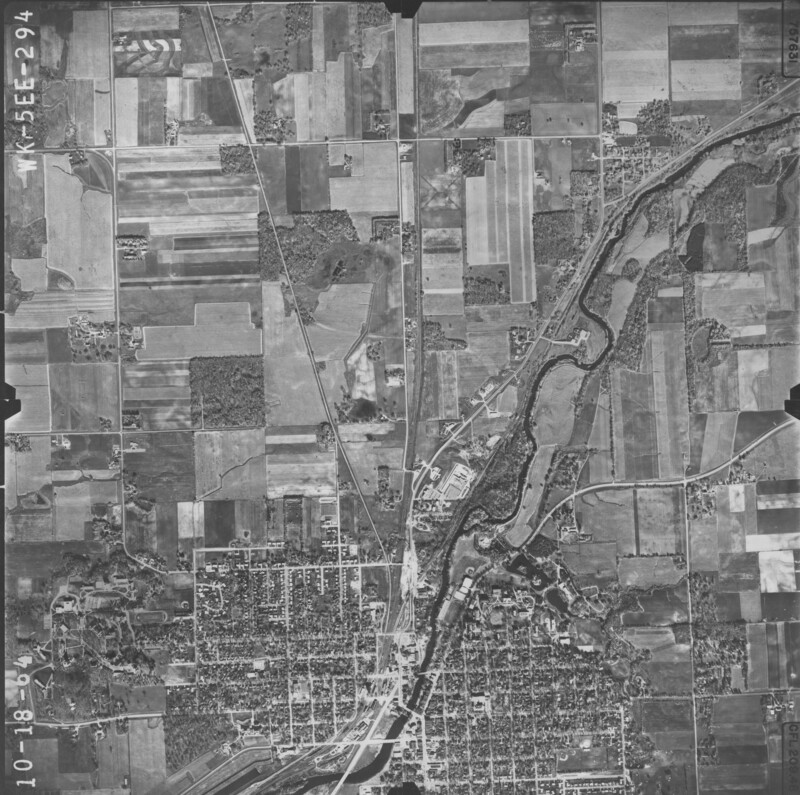 By 1964, the new alignment south of 2nd St was in place…MnDOT’s project log shows it was completed in 1959, so it didn’t take long after the above 1957 aerial photo for the buildings to be cleared. A replacement river bridge at 5th St was also built between ’57 and ’64. Also of note, construction was underway to replace the old bridge over the Cannon Valley rail spur…this took out at least 6 houses plus 1 additional building, mostly clustered at the St. Olaf Ave intersection. 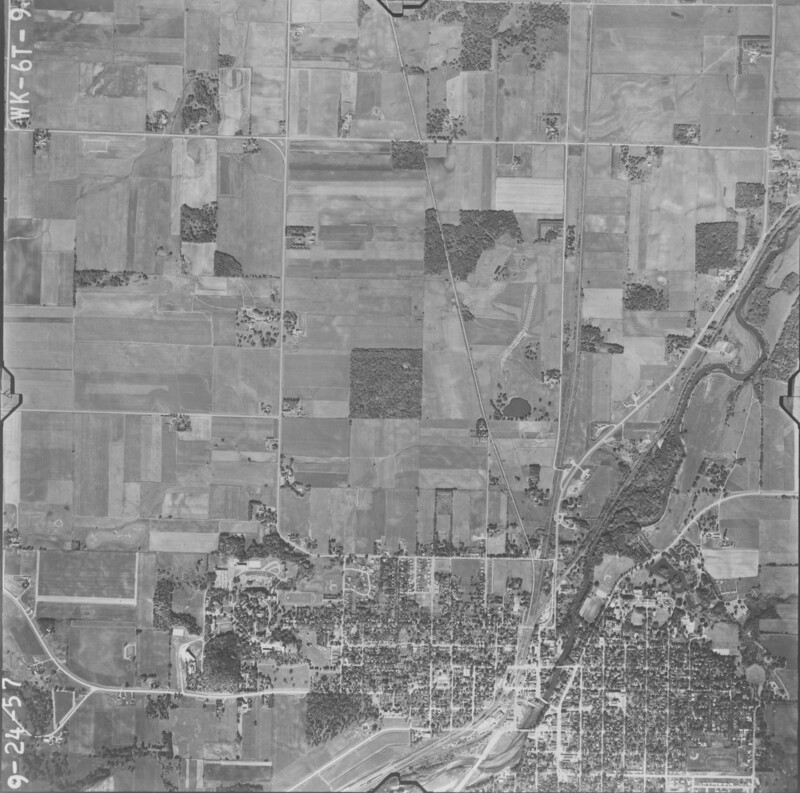 But in 1964, most of the buildings on both sides of Hwy 3 north of 2nd St remained intact (judging from aerial imagery, looks like none of them exist today). A few of the old buildings in the “nook” between Water St, 2nd St, and the river still remain, though. The divided roadway section that exists today on Hwy 3 was built 2005-06. There were a few older buildings along Hwy 3 (technically Water St) between 2nd and St. Olaf Ave, but most came down for The Crossing redevelopment project. There is one noticeably older building that remains, but it appears to just be used for storage now, and doesn’t seem to be in great repair. The old lumber yard building on the east side of Water/TH 3 was in even worse condition, IIRC. Thank you for those images! Never forget the old Northfield Quiznos (I remember skipping school and driving to Northfield for lunch there, when I didn’t know about anything better in Northfield). But Triunfo’s tacos are a huge upgrade. I wonder why we couldn’t have had redevelopment of both the “Q block” and the half block against 3rd Street where the Depot currently is. That building with the Chamber of Commerce is quite a fail not only architecturally, but the setback from Hwy 3. Speaking of, Hwy 3 is the biggest missed opportunity in modern Northfield history. I’ve never seen the traffic present to justify the five lane stroad configuration… and the only reason for any sort of bunching is because of the two stoplights. This should have been a 2-3 lane segment, with roundabouts at 2nd, 5th, and St Olaf Ave. This would have said to motorists, “hey slow t.f. down, this is an urban street not a rural highway” and would have been much more compatible with rebuilding a real western edge of downtown with proper setbacks approaching zero. In fact, this could have been an epic multiway boulevard with two lanes of TH 3, flanked by slip lanes with 15 MPH design speeds (bike friendly, too) and on-street parking for businesses with the aforementioned lack of setback. At this point, I’m curious what triage could be done to calm T.H. 3… maybe allow on-street parking in place of traffic lanes? As things are now, MN 3 between Jefferson and Woodley is pretty close to the 20,000 limit for 3 lane roads, and a double lane roundabout would likely be required at 5th. Things would change a lot if the decades long discussed Jefferson Parkway extension was built across the river that would let a lot of the through traffic bypass the area, in that case there wouldn’t be any question that a three lane section and single lane roundabout would work. Thanks, Ross – no doubt you could add additional detail about all the planning efforts and conversations about better bike/pedestrian crossings, too. For those interested I have a Facebook page for supporting passenger rail to Northfield on the Dan Patch Line. [WORDPRESS HASHCASH] The comment’s server IP (208.80.4.113) doesn’t match the comment’s URL host IP (208.80.5.208) and so is spam.